5/17/2018 - Proven Winners® ColorChoice® Oso Easy® Petit Pink Rosa has been honored with the designation as a 2019 A.R.T.S. Master Rose. The distinction has been awarded by the American Rose Trials for Sustainability (A.R.T.S. ), a rose trialing program with adjudicators comprised of horticulturists, rosarians, university scientists and other green industry professionals. With an aim to provide objective and reliable information about superior no-spray rose cultivars, the organization awards rose introductions that are ecologically-responsible as well as visually appealing, requiring a minimal input of resources for maximum output of performance in the landscape. Rose submissions are sent to trial sites representing varying major climate regions throughout the continental US. Awards are based on overall performance across two growing seasons, relative to specific reference cultivars. Each spring, Local Artist awards are granted regionally; and those that earn a Local Artist award in four or more regions earn the premier designation of A.R.T.S. Master Rose. For 2019, eight rose cultivars have earned A.R.T.S. Master Rose awards and three have earned Local Artist awards. A.R.T.S. Master Rose awardee, Oso Easy® Petit Pink features bubblegum pink, double-flower sprays on a refined mound with strong continuous bloom and exceptional disease resistance. 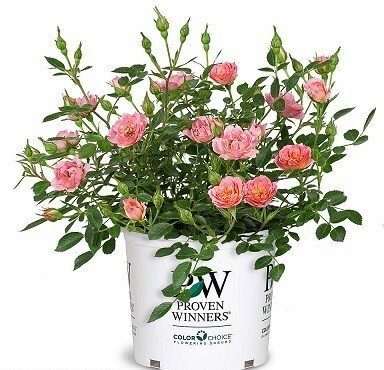 Developed by David Charles Zlesak, this Proven Winners® ColorChoice® variety has also earned the 2012 Miniature/Miniflora Rose Award of Excellence by the American Rose Society.